After an exciting finish to the South African Open which saw Englishman Andy Sullivan win the first event of 2015 by beating Charl Schwartzel in a play-off, we head over to Abu Dhabi for one of the best European Tour events of the season. Last year’s winner was the inconsistent Spaniard Pablo Larrazabal and he’ll be looking to retain his title although he’s up against an extremely strong field. The field features the world number one Rory McIlroy who is the 9/2 favourite and Justin Rose, Martin Kaymer, Henrik Stenson and Rickie Fowler also take part and are unsurprisingly near the front of the betting. Since the launch of the Abu Dhabi Championship in 2006, Abu Dhabi Golf Course has hosted this event and it’s delivered some entertaining tournaments. The course is a par 72 that plays a testing 7600 yards and the winning score is expected to be around 15 under par, similar to previous years. Driving distance is certainly advantageous around this track with the shorter hitters off the tee finding it difficult more often than not. Last year’s winner Larrazabal hit just 46.4% of fairways on his way to victory which suggests driving accuracy is far from essential. Victor Dubuisson – I think the talented Frenchman should be a shorter price than the likes of Schwartzel, Willet and considerably shorter than Olesen, therefore I’m happy to back Dubuisson to win the Abu Dhabi Championship at 40/1. Victor is coming into this event off the back of a very good 2014 season. He finished 5th in the Race to Dubai and recorded four second place finishes, two of those in strong fields in the WGC Accenture Match Play Championship and the DP World Tour Championship. It should also be noted that Dubuisson performed well in the majors, he finished in the top ten of the The Open Championship and the USPGA Championship, these results show what a quality player he is. The reason for such a generous price on Dubuisson is his poor course form, he has played in this event on two occasions (2012 and 2013) and he has missed the cut on both occasions however he has improved as a player since these appearances. The Frenchman’s game should suit the course, he’s lengthy off the tee, averaging 301.2 yards with his driver and Dubuisson is excellent around the greens which is certainly beneficial around this course. Michael Hoey (First Round Leader) – Michael Hoey is coming into this season off the back of one of his better seasons on the European Tour and I’m keen to back him to be the first round leader at a huge 200/1. Admittedly I don’t think the Northern Irishman is good enough to win this event but he’s certainly capable of leading after round one. During 2014 Hoey recorded six top ten finishes and after the opening round he had featured in the top ten on nine occasions. He’s a five time winner on the European Tour, although I do admit those wins have come in some of the smaller events but it shows he’s a decent golfer. 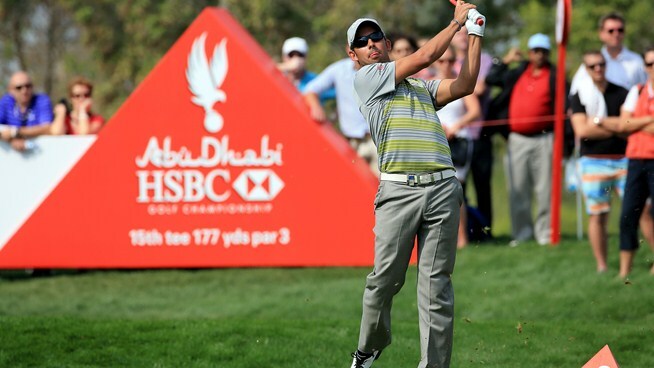 In this event last year Hoey finished in tenth position and he was eleventh after round one, this shows he is capable of putting in a good performance around Abu Dhabi Golf Course. Finally driving distance and greens in regulation % are important statistics around this tricky course. Last year Hoey was ranked 64th on the European Tour in terms of driving distance and 18th in terms of greens in regulation hit % therefore the course should suit.